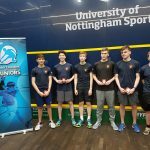 On the 13th and 14th of January seven Northumbria teams descended on Nottingham to take part in the Junior Inter County Championship Finals. Both our under 17 teams had done incredibly well to make it to the Main Finals (the top four teams in the country) and four of our other teams had reached the Trophy Finals (the equivalent of a plate competition). For the first time the Trophy Finals in all age groups had been held all together at the same club meaning an exciting atmosphere for all teams taking part. First up were our girls under 11 team made up of Northern’s dynamic duo Kate and Ava Naisbitt and nationally ranked number 4 Shae Paterson, all making their debuts this year in the JICC. Hampshire were the first opponents and despite Kate getting us off to a fantastic start winning 3-0 both Shae and Ava fought bravely to win their own matches 3-2 against tough opponents. The girls were through to the final, a fantastic achievement! The next opponents were Worcestershire, only made up of two players so Kate’s match at string 3 was deemed a walkover. Shae went on first to try and bag the win for Northumbria and despite nearly giving her mum and coach a heart attack managed to push through in the 4th game to win 3-1, VICTORY to the girls!!! 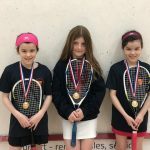 Ava played out the dead rubber, losing to a really talented player but it didn’t matter the girls had won the Trophy, well done to all involved including parents Richard, Sharon and Angie! Our boys under 13 team this season have gelled together seamlessly and a trip to the finals was a just reward for the lads and team manager Paul Taylor. The team has been made up of players from all over the county: Alnwick’s James Taylor, Northern’s Will Johnson, Hexham’s Tom Jepson and Luke Radley and Jesmond’s Angus Dean and Ollie Forster. The first opponents were an unknown quantity in South-East Wales, a supplier of some talented squash players throughout the last decade. Although all of our players were in with a shout of winning their respective games the Welsh players managed to have that little bit extra to attack the front of the court and the team lost out 5-0. In the 3/4 playoff Lincolnshire lined up to take the boys on and in a hot tempered affair our lads lost their way at key moments, unfortunately finishing the Trophy weekend in 4th place. Special credit goes to our number 6 Luke Radley who still travelled as reserve and put in a monumental effort in his match, just losing out 3-2. Hopefully some valuable lessons will have been learnt and I know the boys have really enjoyed playing together despite coming from many different clubs. Let’s hope the coach is invited to the end of the season (cough, cough) social which sounds amazing. 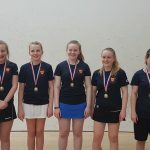 Lead by legendary county squash supporter Tim Barker our girls under 15 team faced Norfolk in the first semi-final of the Trophy competition, a county we don’t often come across. Even though Northern’s Naomi Appleby and Rebecca Grogan won comfortably at strings 4 and 5, Norfolk’s top end were too strong with fellow Northern players Anna Moore and Katie Barker both losing out 3-0 and finally Jesmond’s Beth Dean suffering the same fate. In the 3/4 playoff it was the same story but our team’s strength and depth shone through this time with Rebecca, Naomi and Anna all winning comfortably. Katie and Beth had to face the England number 1 and 6 respectively, a great opportunity and both gave a great account of themselves to the delight of manager Tim. Well done girls, a bronze medal to finish a great season. 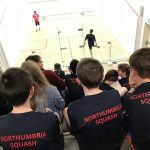 The under 15 age group has always been a strong one for Northumbria and this season was no different. Unfortunately however in the initial stages the team was blighted by injury and illness. A big thanks go to the players who managed to get us through to the Trophy finals including Milan Stach, Kieran Mahoney and Sam Sweeney, and of course passionate team manager and chauffeur Kevan Mahoney. 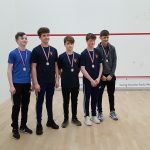 The finals team consisted of Kieran and Sam along with Tynemouth’s magician Tom Walsh and Jesmond’s quality pair of Matthew Dyter and Sion Gittins. In a straight forward semi-final against Kent 2, the boys eased through 5-0 to set up a final against Cambridgeshire. Unfortunately a solid win from Sion and a monster 5 setter victory for Tom (after declaring at 2-0 down he would win 3-2) couldn’t propel us to the gold medal with Kieran, Sam and Matthew coming un-stuck. So 2nd place it was for the boys, thanks to all the parents involved who are all so supportive. And on to the main finals. The under 17 girls lead by manager Lesley Vitty prepared in their usual fashion of a sauna and swim the night before along with a gentle hit on the hotel squash court (She knows how to run a team…). This group of girls have been successful throughout their junior careers and the a lot of credit must go to Northern’s head coach Richard Vitty with the team containing the club’s Emma Delgaty, Aanya Hamilton, Erin Vitty, Harriet Wight, Lucy Anderson and Megan Evans. Throw in Lowri Waugh from Jesmond and you have yourself a very strong team and the finals was proof of that. In the semi-finals it was too close to call against Surrey in the early stages but an inspirational victory from Lucy put the girls in the right mood and they all played out of their skins to record a crushing 5-0 victory. The odds were stacked against each and every one of them in the final however with all of our players playing opponents ranked above them. 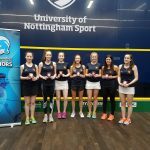 Another nail in our coffin was the fact that the match was played on the glass court at Nottingham University, a great experience but the first time a lot of our girls had even played on one! The girls struggled with the new conditions and were probably out classed in the end but let’s not take away from what has been a dazzling performance by all of the girls. The second best team in England and Wales, just let that set in… Again a big thanks to all the parents involved and also to Aanya and Emma who travelled despite not getting a game, this really is a team that looks after each other. Last but certainly not least our boys under 17 team. Again this has been a successful group of players throughout the age groups at county level, which is even more amazing considering the players they come up against nationally. The team managed to beat a very strong Yorkshire on the way to the finals which is no mean feat and faced off against Warwickshire in the semi-final. Team manager Dave Shipley lead out a team featuring Jesmond’s Max Forster and Harry Little, Northern’s Andrew Shipley and Thomas Moore and Tynemouth’s Nathan Dobson and Lennox Lockwood. Nathan got us off to a fabulous start with a comfortable 3-0 win but Harry got out maneuvered by Dan Haggerty meaning it was all square. Lennox was looking like he could go the distance but bad luck hit hard with an achilles injury slowing him down and preventing any win. Max renewed his rival with British Champion Lewis Anderson and battled hard in the early stages to break his opponent’s backhand down and take an impressive 3-1 win. It came down to a deciding rubber and we all settled in for a roller coaster of emotions as the entertaining Andrew took to the court. But it wasn’t to be as Andrew found a lot of tins and Warwickshire went through to the final. In the 3/4 playoff versus Buckinghamshire our number 6 Thomas Moore stepped in and coolly put away his opponent 3-0. This was followed by a gutsy win for Harry Little and a 3-1 win for Nathan that turned into a tricky encounter. Max and Andrew finished off the dead rubbers with wins, Andrew coming back from multiple match balls (standard procedure). Congratulations boys and thanks go to Dave, Scott and Alistair for organising the weekend. 3rd in the country is still a brilliant achievement for a really grounded and lovely bunch of lads, your County is proud!! It goes without saying that I’m always proud of the way our players conduct themselves both on court and off court and I’m sure all the parents would second that. Thanks again to all the parents who’ve helped run the teams, we couldn’t do it without you. I know at times the JICC system has been infuriating this season but I’d count this another very successful season for Northumbria and we continue to punch above our weight. Bring on next year! Great report Liam – WELL DONE everyone. I’m must add though – the Girls Under 19’s, as you well know, are in my eyes quite justified in claiming the Trophy title in their age category too. They were only thwarted in that effort by the abysmal administration of the event by the governing body…IMHO. All 3 members of the team are a credit to the county, having flown the flag (often literally) and demonstrated outstanding conduct & sportsmanship whenever called upon. For them, to bow out of junior county activity in such a way is a shame. Josie, Amy, Emma – I SALUTE you ! !